The vascular pathway from pulmonary artery to left atrium can be considered as a series of three functional segments: arterial, 'intermediate' (which includes alveolar capillaries and contiguous microvessels), and venous . Under normal conditions, arterial and venous segments - which are entirely extra-alveolar - contribute most to overall pulmonary vascular resistance. The compliant intermediate segment however, is influenced primarily by alveolar pressures and as a consequence, influences the change in overall vascular resistance that occurs during ventilation. The behavior of alveolar and extra-alveolar vessels during lung expansion is fundamentally different. The structural forces ofinterdependence cause interstitial pressures to fall during inflation, even during positive pressure ventilation . This reduction of interstitial pressure increases the transmural pressure of the vessels in the immediate environment, tending to dilate them. Something quite different, however, happens at the alveolar level. During inflation of a normal, fully aerated ('open') lung, the majority of capillaries embedded within the alveolar wall are compressed by the expansion of adjoining alveoli, even as extra-alveolar vessels dilate and elongate (Fig. 1). Fig. 1. Influence of lung expansion on alveolar and extra-alveolar vasculature. Inflation compresses wall-embedded capillaries but dilates extra-alveolar microvessels. rises monotonically as a function of lung volume . 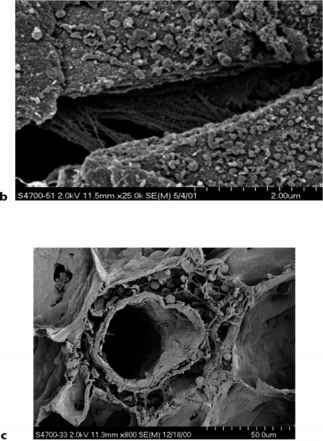 The so-called'corner'vessels, which are located at the junctions of three or more alveolar septae, are simultaneously influenced by competing stresses arising from alveolar and interstitial pressures and do not behave as the wall-embedded capillaries do. Indeed, they may serve as a conduit for some blood to flow through the intermediate segment, even when alveolar pressure exceeds pulmonary arterial pressure . With reference to the vascular contribution to VILI, it is important to consider that even for the normal lung, inflation imposes competing vascular stresses on different classes of microvessels. As discussed later, these competing forces are amplified by the heterogeneity of acute lung injury (ALI). The normal lung exhibits up to three perfusion zones, depending on the relationship between alveolar pressure and pulmonary arterial venous pressure. According to the familiar conceptual model popularized by West , gas pressures within aerated alveoli are everywhere equivalent under static conditions,whereas vascular pressures are influenced by gravity. Zone III conditions, under which both arterial and venous macrovascular pressures exceed alveolar pressure, allow flow to be governed by vascularpressure gradients andresistances. These conditions are most likely to be observed in dependent regions. When alveolar pressure exceeds both arterial and venous pressures, little blood flow occurs (except through corner vessels). Zone II exists where alveolar pressure exceeds pulmonary venous (but not arterial pressure), allowing flow to occur as regulated by the pressure gradient between arterial and alveolar pressures. These latter zones tend to develop in less dependent areas, where hydrostatic pressures are lower. Unfortunately, the application of these useful concepts to the problem of the acutely injured lung is not straightforward. Indeed, their validity for this circumstance - in which collapsed, edematous, inflamed and even fibrotic lung units may coexist in the same micro-environment - can rightfully be questioned. In the setting of ALI, both alveolar and pulmonary arterial pressures are considerably greater than under normal conditions. Moreover, a variety of perfusion states is likely to exist, even along the same transverse plane. Filling of the small airways, alveolar, and interstitial spaces with cells and fluid alters the normal relationships among the pressures and flows of gases and blood. Independent of any variations of local pathology, increased lung tissue density and accentuated pleural pressure gradients tend to collapse dependent lung units, developing shunt and/or extending Zone II conditions to more caudal levels as the interstitial pressures surrounding the microvasculature rise. Under the high permeability conditions of the first stage of ALI, even minor increases in pulmonary microvascular pressure will increase edema formation dramatically. Moreover, unlike healthy tissue whose blood-gas barrier is intact, there is no clear pressure threshold for edema formation . The physiologic consequences of pulmonary edema are well known: alveolar edema compromises gas exchange, and edematous airways impede airflow and secretion clearance. From the standpoint of VILI, however, alveolar flooding may produce competing effects. A well known - if simplistic - model of interdependence proposed by Mead (see below) suggests that collapsed alveoli are subjected to shearing forces that are proportional to the disparity in alveolar dimensions between the collapsed alveolus and its distended neighbors . Completely fluid-filled (flooded) alveoli, therefore, theoretically are subjected to lower shearing stresses than atelectatic units, as the gas-liquid interface is eliminated and alveolar dimensions increase. On the other hand, elimination of surface tension would cause capillaries that are fully embedded in the alveolar walls to bulge further into the interior, encouragingtheirrupture , and the increased weight of the edematous lung may encourage small airway compression and accentuate the tendency for tidal opening and closure to occur. Which of these competing effects predominates cannot be said with certainty. Thus, while the influence of pre-formed edema on lung mechanics and gas exchange is reasonably well described, the importance of the microvasculature to the generation of VILI is less understood. The remainder of this brief review will focus on what is currently known regarding the interactions between airway pressures and vascular pressures in the generation and maintenance of VILI. What Disrupts the Blood Gas Barrier During VILI? Clinicians have long been aware that certain inflammatory conditions of the lung produce tissue hemorrhage in the absence of ventilatory stress. These vessel-disrupting inflammatory injuries may originate from either the alveolar side (e.g., pneumonia, abscess) or from the vascular side of the blood-gas interface. Inflam matory conditions such as Wegener's granulomatosis, Goodpasture's syndrome, and pulmonary embolism are examples from the latter category, disrupting the delicate barrier between gas and blood and allowing erythrocytes to breech their vascular confines and migrate into the interstitium and air spaces. Although inflammation is obviously of potential importance to the breakdown of the lung's structural architecture, simply elevating transmural pulmonary vascular pressure to high levels may cause vascular rents or tears. Perhaps the clearest example in this category occurs in severe mitral stenosis, a condition in which pulmonary venous and capillary pressures can exceed 35-40 mmHg. Acute edema that forms in this setting is typicallyblood-tinged, and thepresence ofhemosiderin-laden macrophages in expectorated or lavaged samples strongly suggests that this process originates at the alveolar level from the pulmonary (rather than the bronchial circulation). Another circumstance under which elevating transmural vascular pressures may cause hemoptysis in the absence of preexisting inflammation occurs during extreme exertion, when blood flows through the lung are extremely high and excursions of alveolar pressure are unusually large. Post-exertional lung hemorrhage is a well-described occurrence in racehorses , and hemoptysis has been reported after heavy exertion in elite human athletes as well . Finally, forceful inspiratory efforts made during upper airway obstruction may produce transvascular pressures of sufficient magnitude to cause hemorrhagic pulmonary edema . Elegant experiments undertaken in the laboratories of West and colleagues have used electron microscopy to demonstrate the potential for mechanical disruption of the microvasculature - 'capillary stress fracture' - to occur when microvascular pressures are elevated to very high levels relative to theirusual operating conditions [12-15]. The pressures necessary to cause capillary stress fracture vary among species, with disruption being observed in healthy small animal lungs (e.g., rabbits), at pressures as low as 40 mmHg. Larger animals, such as dogs, withstand much higher microvascular pressures without losing the structural integrity of the capillary network . Experimental studies reporting capillary stress fracture in animals have largely been undertaken in static preparations in which the airway pressure was held constant and the intralumenal vascular pressures upstream and downstream of the alveolus were equivalent. Under such conditions, structural breakdown is more likely to be seen at high lung volumes relative to resting conditions . Although the range of microvascular pressure applied in these studies might seem to preclude their physiological relevance, much lower vascular pressures might be required if the framework of the lung were degraded by inflammation. Moreover, there is excellent reason to believe that regional transmural vascular forces may be dramatically different when mechanically heterogeneous lungs are ventilated with adverse ventilatory patterns. trauma develops. Clinicians recognize this damage radiographically as air that leaks into the interstitial spaces to cause intrapulmonary gas cysts, mediastinal emphysema, pneumothorax, and systemic gas embolism . It is equally clear that the vasculature can lose its integrity in advance of epithelial fragmentation. Post-mortem examination of tissues from patients with ARDS often reveals areas of interstitial and alveolar hemorrhage, findings which generally have been attributed to the underlying inflammatory process. 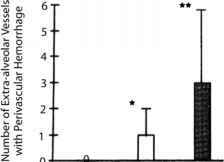 Yet, in both small and large animal models, the application of adverse ventilatory patterns to previously healthy lungs not only causes formation of proteinaceous edema, but also stimulates neutrophil aggregation andhemorrhage [17,18]. Studies conducted in our laboratory strongly indicate that in the supine position, hemorrhagic edema forms preferentially in dependent areas [18, 19]. This proclivity is not subtle, and has been corroborated by the work of other investigators using different injury models . It is worth emphasizing that our experiments have demonstrated that purely mechanical forces originating within the alveolus inflict hemorrhagic injury in the absence of pre-existing inflammation. It is somewhat counter-intuitive that tissue disruption should occur in areas in which transmural stretching forces (as defined by plateau pressure minus pleural pressure) are least. That is to say, 'alveolar stretch' is greatest in the nondependent regions, which are spared both the hemorrhagic infiltrate and most signs of inflammation. Why might this occur? The tendency for hemorrhage to occur preferentially in the most dependent regions ofthelungmayhaveseveral explanations. One compelling reason to expect microvascular disruption to occur there is that the mechanical stresses applied by the tidal inflation cycle are greatly amplified at the interface of opened and closed lung tissues. More than three decades ago, Mead, Takashima, and Leith described a simplified model of alveolar mechanics in which they proposed that an alveolus attempting to close in an environment in which it was surrounded by inflated tissue would experience traction forces that are amplified in nonlinear proportion to the alveolar pressures existing in the open units . By their reasoning, the co-efficient linking effective pressure (Peff) to that actually applied (Papp) is the ratio between the alveolar volume that corresponds to alveolar pressure (V) and the volume of the collapsed alveolus (Vo), raised to the 2/3 power: Peff = Papp (V/Vo)2/3. Their admittedly oversimplified geometrical argument suggested that at 30 cmH2O alveolar pressure, for example, the effective stress applied at the junction of closed and open tissue might approximate a value 4.5 times as great as that experienced in the free walls of the open alveolus. Whatever its quantitative accuracy, a similar line of reasoning might apply when tissues are already atelectatic and the lung is exposed to high ventilating pressures, as in ARDS. Extrapolating from the Mead equation, the traction forces applied to junctional tissues when alveolar pressure is 30 cmH2O could approximate 140 cmH2O, or ~100mmHg. Thus, transvascular microvascular forces duringtidal ventilation could be in the range that West and colleagues suggested necessary for a stress fracture to occur in large animals (dogs). Clearly, such theoretical arguments are widely open to criticism. However, it does seem reasonable to assume that mechanical shearing forces experienced in 'junctional' tissues are likely to exceed those elsewhere in the lung. Moreover, even within fully inflated regions, the competing forces of capillary compression and extra-alveolar vessel dilation/elongationwouldbe expected tobe amplifiedwhenboth lungvolumes and vascular pressures are high. These stresses would tug at the microvascular conduit that links the alveolar and extra-alveolar vessels with potentially damaging force. It is not difficult, therefore, to envision vascular rupture from ventilatory pressure under the pathological conditions of ALI. Although unstudied, surfactant depletion and inflammatory weakening of the interstitial structure could amplify the impact of such forces, whereas other changes of the microenvironment (e.g., flooding by edema) could abrogate the mechanical stresses experienced in distal lung units. Another intriguing possibility to explain disproportionate vascular disruption in dependent lung regions is that dorsally situated tissues receive a majority of the lung's total blood flow and are subjected to greater hydrostatic pressures in the supine position. 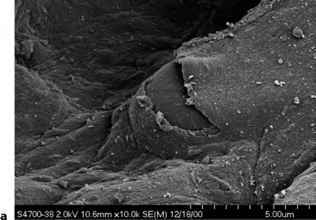 These higher intralumenal vascular pressures or flows might amplify tensile forces external to the microvessels or give rise to shearing stresses within the vascular endothelium that initiate inflammation-mediated tissue breakdown. There are hints in the early experimental literature of VILI that vascular pressure could play an important - if not a pivotal - role in VILI development or expression. Dreyfuss and Saumon, for example, found that ventilation with negative pressure caused damage more severe than that caused by positive pressure, implicating the role of increased blood flow to ventilation related damage . These same investigators provided further support for this hypothesis in showing that rats given dopamine to increase cardiac output suffered increased albumin leak when ventilated with high pressure, and ascribed a major portion of PEEP's protective effect in the setting of high pressure ventilation to its reduction of pulmonary perfusion . 1. The progress of edema formation can be monitored by continuously weighing the heart/lung block suspended from a strain gauge. 2. Breakdown of the alveolar capillary barrier can be inferred from the filtration constant (Kf) derived from the weight-time relationship. 3. In-flow and out-flow vascular pressures and perfusion rate can be precisely measured and/or regulated. 4. The composition and physical properties of the perfusate can be adjusted. In the experiments described below, each heart-lung block was perfused with Krebs-Henseleit solution, doped with a small quantity of autologous blood to provide a histologically visible marker of overt vascular rupture. 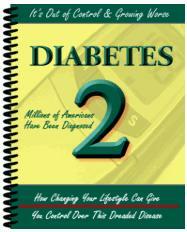 Sufficient albumin was added to achieve physiologic tonicity. The cumulative results of this work demonstrate unequivocally that variations of vascular pressure and flow have the potential to modulate the nature and severity of VILI. Fig. 2. Effect of perfusion on VILI, as indexed by peri-vascular hemorrhage. Pressure or Flow: Which is the Key Variable? We also found a strong correlation between indices of lung injury and the vascular pressure changes resulting from the interaction between ventilation and perfusion . 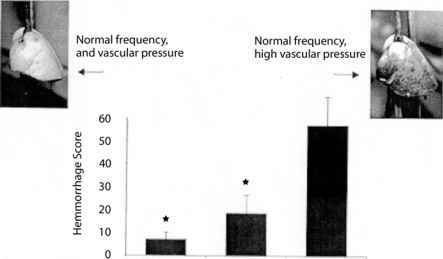 Although data from that experiment strongly suggestedthe primacy of perfusion pressure, it was not possible in that initial experiment to definitively determine which of those two variables was more important in modulating VILI, as vascular pressure increased in parallel with flow. In a second isolated, ventilated perfused lung experiment designed to address that question, we varied airway pressure profiles to allow arterial pressure to vary while blood flow was held constant . Our results indicated that mean airway pressure was a higher impact variable than tidal excursion amplitude in determining the severity of the lung hemorrhage and lung permeability alterations resulting from an adverse pattern of mechanical ventilation. Histologic injury scores were virtually identical for large and small VT when high mean airway pressures were achieved, whether by lengthening inspiratory time or by increasing PEEP, respectively. A key difference between high mean airway pressure and low mean airway pressure preparations was the magnitude of the pulmonary arterial pressure and the length of time over which it was sustained. The results of those experiments emphasized the potential for deleterious interactions to occur between lung volumes and pulmonary hemodynamics. Taken together, our initial two studies demonstrated that modifications of vascular pressure within and upstream from the intermediate segment could influence the severity of VILI inflicted by an unchanging adverse pattern of ventilation. How Does the Number of Ventilatory Cycles Influence the Expression of VILI? Although ventilation is the product of Vt and frequency, surprisingly little attention has been directed to the role of the latter in the generation of VILI. Therefore, having concluded that upstream microvascular pressure might be an important co-factor in the development of VILI, we next addressed the question of how the number of ventilatory cycles occurring over a timed interval influences the rate of edema formation or severity of histologic alterations when maximum, minimum, and mean airway pressures are held identical. Almost 15 years ago, Bshouty, and Younes reported that for the same minute ventilation target, raising Vt at a constant rate and raising frequency at a constant Vt produced similar degrees of edema in canine lobes perfused in situ at elevated hydrostatic pressures . About the same time, Kolobow and colleagues demonstrated that sheep ventilated over many hours with high and moderate airway pressures sustained more lung injury than those sacrificed earlier, suggesting the potential for cumulative damage to occur under adverse ventilatory conditions [28, 29]. We used our isolated, ventilated and perfused model in experiments testing the hypothesis that cumulative damage occurs as a function of the number of stress cycles as well as stress magnitude. In these experiments, the pressure controlled mode with a peak pressure of 30 cmH2O and a PEEP of 3 cmH2O was used in each preparation . Each experiment was conducted over 30 minutes. In one of three experimentalgroupsofisolatedandperfusedrabbitlungs,apulmonaryarterypeak pressure of 20 mmHg was matched to a ventilatory frequency of 20 cycles per minute to serve as our control. In a second set of perfused lungs, pulmonary artery pressure was allowed to rise to a maximum of 35 mmHg with each tidal cycle, at a frequency of 20 breaths per minute. In the third group, peak pulmonary artery pressure was again capped at 35 mmHg, but ventilator frequency was reduced to 3 cycles per minute with the same inspiratorytime fraction as in the other two groups. Thus, mean airway pressure was identical for both high-pressure ventilatory patterns. The pH characteristics did not vary significantlyamong the groups. Our main findings were that lungs ventilated at low frequencies and high peak pulmonary artery pressures formed less edema and displayed markedly less perivascular hemorrhage than did those ventilated at higher frequencies but identical peak pulmonary artery pressures. In addition, lungs ventilated with high peak pulmonary artery pressures and flows demonstrated more extensive histologic alterations and edema formation than did those subjected to the same ventilatory pattern but at lower peak vascular pressures and flows  (Fig. 3). Only a very small fraction of this difference was attributable to differences in mean hydraulic pressure. These data strongly indicated that not only are the characteristics of the tidal cycle and vascular pressures of fundamental importance to VILI, but also that minute ventilation, reflecting the number of stress cycles of a potentially damaging magnitude per unit time or their cumulative number, might be as well. whereas their study was conducted with a physiological ventilatory pattern, we employed ventilatory patterns known to be potentially injurious. Second, vascular pressure in the Bshouty study was elevated by raising outflow (left atrial) pressure, thereby increasing pressure along the entire vascular tree (a simulation of left sided congestive heart failure). We held outflow pressure constant at a physiologically normal value while raising pressure selectively in those regions proximal to the intermediate vascular segment. Third, we used considerably higher vascular flows on a per gram of lung basis than did Bshouty and Younes . Finally, we not only measured edema but also assessed histologic changes, as reflected by lung hemorrhage. Fig. 4. Electron micrographs of rabbit lungs injured by high inflation pressures, low PEEP, and elevated vascular inflow pressure. (a) Capillary stress fracture with incipient extravasation of an erythrocyte. are subjected to sufficient repeated stress . Overt stress fractures similar to those found by West and colleagues have been demonstrated by scanning electron microscopy in our laboratory (Fig. 4) and in a recently reported human patient . A type of'materials failure' of structural elements seems an attractive explanation, in that we found that both reducing stress application frequency (respiratory rate) and stress amplitude (pulmonary artery peak pressure) effectively limited VILI. If cumulative damage is important, providing a lower frequency and/or lower pulmonary vascular pressure would be expected to reduce the tendency for material stress failure. Finally, it is interesting to consider that a low frequency may have allowed sufficient time between adjacent cycles for reparative processes to operate. Surprisingly little time appears to be needed to re-seal small disruptions in tissue barriers [32, 33]. What are the Relative Roles of Vascular and Airspace Pressures in VILI? Because rigorous limitation of pulmonary vascular pressures significantly attenuated the damage in lungs exposed to a fixed ventilatory pattern, the work outlined above suggests that elevations of pulmonary vascular pressure arising from interactions between lung volume, pulmonary vascular resistance, and pulmonary vascular flowcould worsen VILI. Our re-directed attentiontoward the vascular side of the alveolar capillary barrier stimulated us to ask the question: Does the mechanism by which pulmonary artery pressure is phasically increased influence the severity of lung damage during exposure to high alveolar pressure? In other words, is periodic inflation a necessary component of the vascular injury incurred during VILI? Knowing that the frequency of ventilation was an important determinant of VILI, we reasoned that a lung exposed to pulsatile vascular pressure but not ventilated might experience significant injury, even without fluctuations of airway pressure. In an experiment designed to test this question, we applied a damaging pattern of airway pressure (plateau 30 cmH2O, PEEP 5 cmH2O) to one of three sets of lung preparations and allowed others to remain motionless . In the ventilated group, peak pulmonary artery pressure was allowed to rise to 35 mmHg. Left atrial pressure was held at 10 mmHg and mean airway pressure at 17.5 cmH2O. This set of ventilated preparations was compared to two unventilated groups held without tidal fluctuations of airway pressure (continuous positive airwaypressure [CPAP] = 17.5 cmH2O) in which in which all key hemodynamic pressures - peak, mean and nadir - were identical to their ventilated counterparts. In the latter two groups, a vascular pump applied pulsatile pulmonary artery pressure to the motionless lungs at frequencies of 3 or 20 pulses per minute. Each vascular stress cycle, whether generated by ventilation or by the vascular pump, was characterized by identical peak, mean, and nadir values. Our main findings were that lungs exposed to cyclic elevations of pulmonary artery pressure in the absence of ventilation formed less edema and displayed less perivascular and alveolar hemorrhage than ventilated lungs exposed to similar peak and mean pulmonary artery pressures and mean airway pressure . 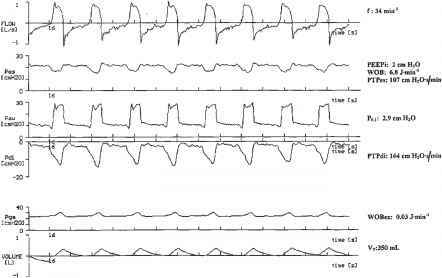 Interestingly, under static CPAP conditions the higher pulsing frequency was associated with a greater degree of perivascular hemorrhage, indicating that the pulsatility of vascular pressure did contribute to VILI. Thus, the effects of respiratory frequency and vascular pressures on VILI are not mediated primarily by pulsatile vascular pressure per se but rather by a phenomenon related to cyclical modulation of the vascular microenvironment induced by ventilation. Because alveolar and extra-alveolar microvessels are stressed differently by lung expansion, these experiments focused our attention on the extra-alveolar mi-crovasculature, suggesting the cyclic changes in perivascular pressure surrounding extra-alveolar, juxta-capillary microvessels might be important in the genesis of VILI. Should Vascular Pressures be Lowered to Avert VILI? Given that elevation of pulmonary vascular inflow pressure accentuated VILI, it seems logical that reduction of post-alveolar vascular pressure would also be protective. The merit of reducing left atrial pressure might be expected for at least two reasons. The edematous lungs tend to collapse under their own weight and to develop dependent atelectasis, which could lead to cyclic opening and collapse, intensified shear stresses, and a tendency for VILI in dependent areas. Moreover, exudation of protein-rich fluid has the potential to inactivate surfactant, further altering membrane permeability by increasing both surface tension and radial traction on pulmonary microvessels. On the other hand, increased left atrial pressure might help to limit VILI by flooding the alveoli of dependent regions, thereby reducing regional mechanical stresses. Moreover, reducing capillary pressure could promote cyclical vascular recruitment and derecruitment as the lungs transition from West's Zone III to Zone II condition during the course of the positive pressure inflation/deflation cycle. Hydrodynamic forces may well be accentuated by the higher velocities and surface shear stresses that occur along the vascular endothelium under such conditions. 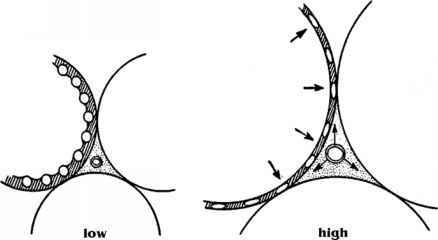 Moreover, reducing outflowpressure increases the gradient of pressure appearing across the alveoli, and consequently the energy dissipated across the intermediate segment. For these reasons, the impact of selectively reducing pulmonary venous pressure during ventilation with high airway pressure cannot be easily predicted. A recently published comparison of lungs ventilated with moderately high peak alveolar pressures with normal and low left atrial pressures demonstrated a striking difference in favor of the normal vascular pressure subset  (Fig. 5). This rather surprising result suggests that cyclical opening and closure of stressed microvessels could be important in the generation of VILI. Alternatively, decreasing outflow pressure might amplify microvascular stresses at or near the alveolar level, presumably acting through interdependence of the pulmonary vascular network. We speculate that direct mechanotransduction of inflammatory signals, increased transalveolar energy dissipation, or materials failure at the stressed boundary could be important linking mechanisms. Fig. 5. 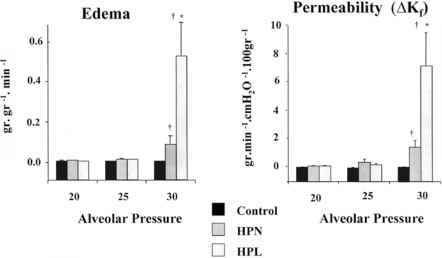 Effect of reducing outflow pressure on edema formation and vascular permeability when ventilating isolated perfused rabbit lungs with high tidal inflation pressure and low PEEP. When peak alveolar pressure is 30 cmH2O, lungs perfused with high inflow pressure and low outflow pressure sustain more edema and altered permeability than do lungs whose vascular outflow pressures are reduced. (Data from , with permission). Manipulation of cardiac output and vascular pressure is of vital importance in critical care management. The interactions between vascular pressure and ventilation outlined in this chapter suggest strongly that closer attention should be paid to interventions that impact vascular pressures, flows, and resistances when high inflation pressures are in use. Because microvascular stresses appear to be a potent cofactor in the development of pulmonary edema as well as lung damage resulting from an injurious pattern of ventilation, the clinician managing ALI must reconcile the competing objectives of ensuring adequate oxygen delivery and minimizing adverse effects. For example, an increase in cardiac output is generally held to be a beneficial consequence of management; however, increases in cardiac output are associated with an increased pre-alveolar microvascular pressure and a higher vascular pressure gradient across the lung. If increased pre-alveolar microvascular pressure accentuates a tendency for VILI, attempts to raise cardiac output may have unintended consequences. On the other hand, taking steps to reduce oxygen consumption demands could benefit the lung by reducing the pressure gradient developed across the microvasculature. Similarly, a reduction in left atrial pressure with maintained cardiac output is generally believed to benefit lung function, and this perception is almost certainly accurate with respect to hydrostatic edema formation. However, the results of the recent work already cited suggest that excessive reduction of left atrial pressure could amplify the tendency for VILI . Because reducing ventilation frequency decreases the number of stress cycles, our work would suggest that a reduction in minute ventilation effected either by a decrease in Vt or a decrease in ventilatory frequency might have a salutary effect in reducing the tendency for VILI. Reduced minute-ventilation is generally associated with increased CO2 retention and hypercapnic acidosis, which until recently has been considered an undesirable but necessary consequence of a 'lung protective' ventilation strategy. However, when the lung's gas exchanging properties are not dramatically altered and CO2 production remains unchanged, recently published experiments by Broccard, Sinclair and their respective colleagues strongly indicate that the generation of hypercapnic acidosis may exert a protective effect on the severity of VILI [35, 36]; this observation is consistent with elegant work that previously addressed is-chemia/reperfusion injury . Because interventions such as increasing PEEP or extending inspiratory time may redirect blood flow and radically alter the microvascular environment, it is conceivable that both benefit and harm could potentially result from these maneuvers. The body of investigative work just reviewed suggests that a reduction in the demands for cardiac output and ventilation could dramatically reduce the tendency for ventilator-induced lung injury even when using patterns that generate similar values for peak and end-expiratory alveolar pressures. Whether these intriguing possibilities are relevant to the clinical setting will require extensive and careful additional study. How does cpap affect frc? Are hypoplastic lungs easily ventilated with low inflation pressures?